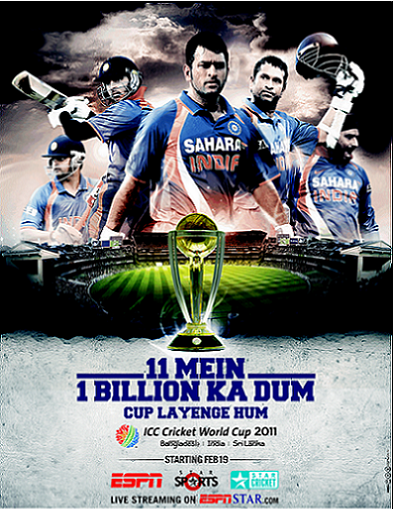 ICC is expected to garner almost Rs 900 crore of revenues from World Cup this year and almost half of that would arise from India itself. So what we understand is about Rs 45 crore of tax will be exempted on these revenues.The cabinet announced that tax exemption will be given to the revenues arising from India for ICC and all of its subsidiaries, so that’s about Rs 45 crore of revenues. Now I guess. You had understood the game far better than others…where is the actually plant of money grown up in India. Its pleasure to inform you that about 67.3 million viewers tuned in to watch the match yesterday. In my previous post, I had mentioned that the advertisement spot rates for yesterday’s match was about Rs 15-20 lakh per 10 seconds and now that India is in the finals these spot rates are expected to go as high as Rs 40 lakh. After all i believe that INDIA VS SRILANKA WORLD CUP will probably be the best Cricket WC match of 2 contemporary legends, batting maestro Sachin Tendulkar and bowling great Mutaiha Muralitharan. that's why top commentators says "cricket match is the going on between ----- vs-------- wait till the last ball.....be patience... "